On Monday and Tuesday (Days 32 & 33) I was travelling, and thus the work on the fireplace continued without my help. 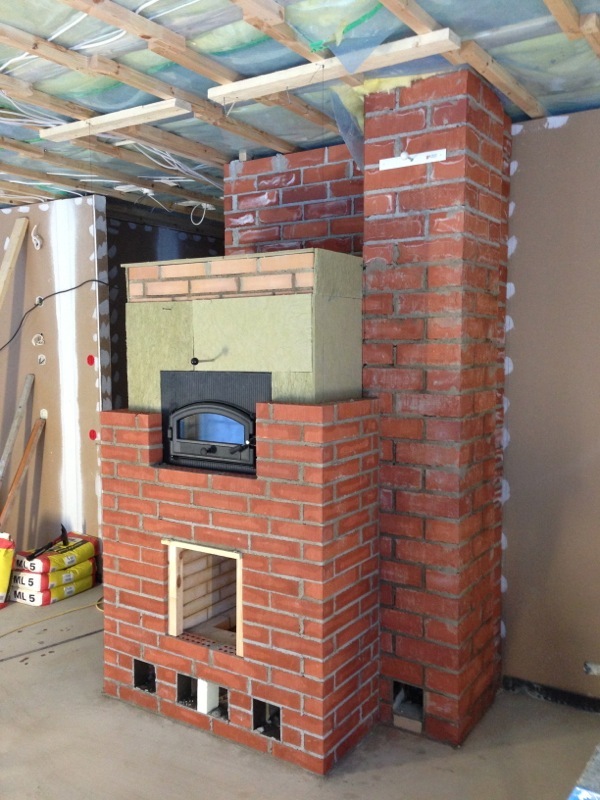 On these two days, the chimney was built and brought through the ceiling of the living room into the loft. Also, the door for the oven was installed. The photo above is taken at lunch break of Day 34 (Wednesday, 27th Feb), after we built also the first layers (1–11) of the shell. The shell will later be covered by plaster, which will then be painted. The next photo shows how far we got today, and after cleaning up the place. 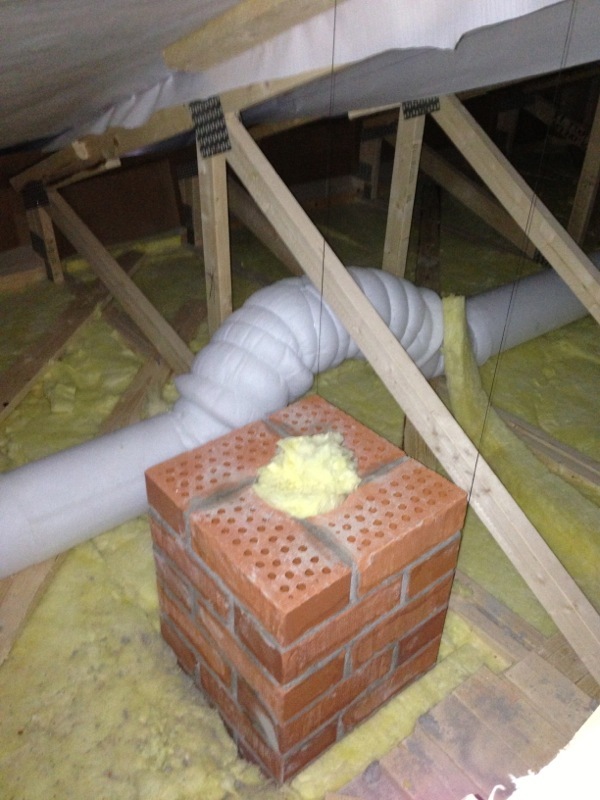 Clearly visible is the mineral wool insulation, which is a fireproof shield between layers of different types of brick. 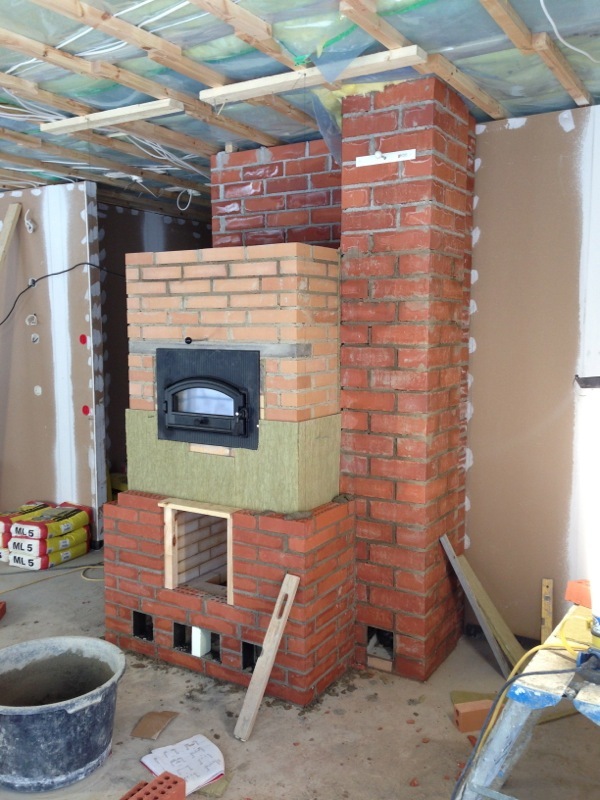 Tomorrow, most likely no work will be done, but on Friday the brickwork will be complete. The loft is accessible through a tiny door in the front wall of the house. The door is just big enough to squeeze through, and really only meant for maintenance access. Here's the view inside the loft towards the exit. 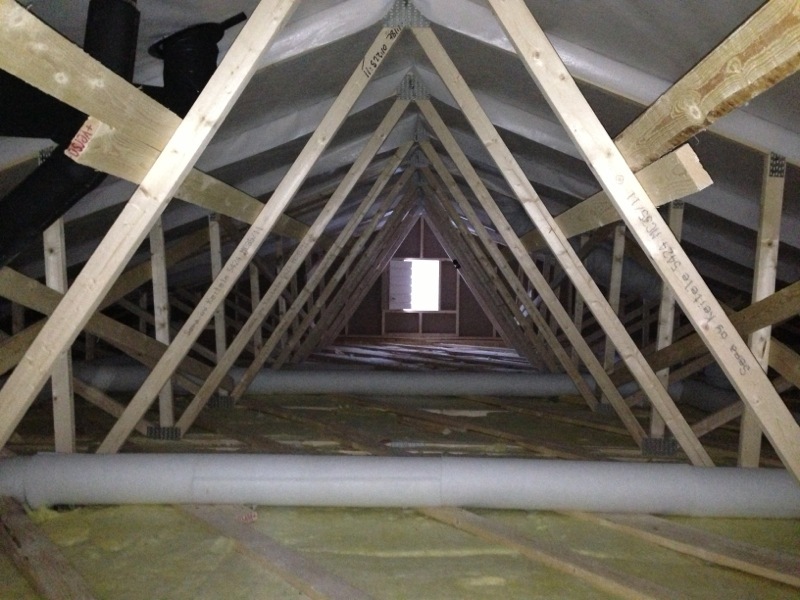 The white pipes are part of the ventilation system. The chimney is protruding from the ceiling's insulation by five layers. It is closed for now by a makeshift plug of mineral wool, in order to prevent cold air from the loft to flow into the house, and thereby not only cool the inside, but also hamper with the drying process of the mortar of the chimney. Now we need to wait for period of two days, during which there's no snow fall or rain, and during which it is reasonably warm. We will have to open up the roof by taking two panels off, then bring the chimney up to its final height, and then close the roof and seal it around the chimney. This can hopefully be done some time in March or April.